Food not only fuels the body, it also fuels the imagination. While composing today’s post, my mind wandered to the glorious Iberian Coast. We spent more time up and down the coast of Portugal, where we would go to tiny seaside eateries with wonderful fresh Seafood netted right off the deck to enjoy with our chilled glasses of Vinho Verde. We should have also spent more late nights in crowded, noisy, delicious Spanish Tapas bars. I’m certain that this dish is typical of what one would find throughout the country. 1. Put the EVOO in a skillet just big enough to hold the Shrimp in one layer & turn the heat to low. Add the Garlic & adjust the heat so that it barely sizzles, when the EVOO takes on color, add the Paprikas, Chipotle, Cumin & Red Pepper Flakes. Stir for a minute or so to incorporate. 2. Add the Shrimp. Raise the heat & cook, turning once or twice, until firm, 3 minutes or less. 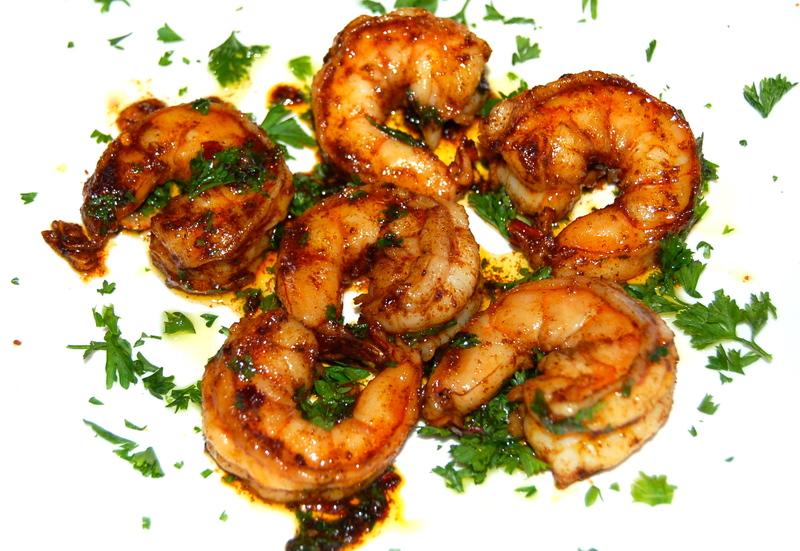 If overcooked, Shrimp becomes tough & inedible.